A brow lift is a surgery that aims to lift the brow in patients whose eyebrows sag downward. It is also known as a forehead lift, since it stretches the forehead, reducing wrinkles while simultaneously lifting the eyebrows. When compared with traditional “open” brow lift techniques, thise endoscopic technique has the advantage of being performed using small incisions in the scalp; as a result, it is much less invasive than older techniques. Who is a candidate for an endoscopic brow lift? Many patients who express interest in having an upper blepharoplasty have some degree of eyebrow-sagging. Most of these patients will achieve satisfactory results with just a blepharoplasty, since they have slight drooping of the brow. But those patients with moderate or severe drooping need a brow lift, since a blepharoplasty alone will not adequately elevate the eyelids. Candidates are most commonly women over 40 who want a rejuvenated look in the upper third of their face and who are in good general health. 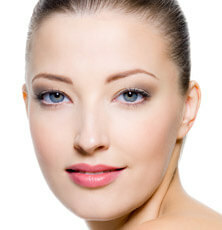 The brow lift surgery involves raising the forehead and eyebrows to the desired position. To do so, we must weaken the ligaments and muscles that maintain the eyebrows in their position. Access is gained by making five 1.5 cm incisions in the scalp; as a result, they are invisible. Through these incisions, subcutaneously, the surgeon reaches the suspensory ligaments and depressor muscles of the eyebrows with the help of a tiny camera (endoscope) and an instrument. Once these ligaments and muscles have been weakened, the forehead and eyebrows are now free and can be fixed at the desired height. This can be done by different means depending on the case, but we almost always use an absorbable fixation device. It is common to perform an upper blepharoplasty along with a brow lift, but in these cases, the blepharoplasty is always more conservative. If necessary, a lower blepharoplasty can also be performed at the same time. Sometimes, due to the patient’s individual features, we opt for another type of technique to lift the brow. For example, in cases where only the outer end of the brow is drooping, we can choose to perform a lift on only that part of the brow, making only two incisions in the scalp. In elderly patients or those who suffer from facial paralysis, we usually choose to lift the brow externally (direct browplasty). This technique is performed by making an incision just above the eyebrow’s hair follicles, which is why, if done correctly, it is usually unnoticeable within a few weeks. Prior to the brow lift, you will have a consultation with Dr. Nieto during which you will discuss the features of your face, the possible options, and the goals you wish to achieve. This visit lasts between 30 and 45 minutes. We will ask you to complete a brief questionnaire about your health, ocular problems, and previous surgeries. It is important for us to know about preexisting medical problems, as well as allergies to medications and any medications you are currently taking. During the same visit, we will perform a complete eye exam in order to verify that you are in good ocular health. Dr. Nieto is an expert ophthalmologist, with training in one of the best hospitasl in the country, which is why your ocular health is in good hands. It is especially important to detect dry eye problems (reduced tear production), since in these cases we usually perform more conservative surgeries to avoid aggravating this condition. If you have previously had laser, cataract, glaucoma, or retina surgery, this is not an impediment for undergoing the procedure, but it is important that these issues are controlled and stabilized prior to surgery. Before the procedure, you must undergo lab tests with a clotting analysis and an electrocardiogram, which you must bring with you on the day of your surgery and submit to the anesthesiologist. In special cases, a visit with the anesthesiologist may be necessary prior to surgery. You must come to the surgical centre, accompanied by another person, about 30 minutes before the surgery, bringing the necessary documentation that we have requested from you, as well as the preoperative tests. Once you are in the operating room, the team of nurses will ensure that you are comfortable and relaxed; then the anesthetist will, check your vital signs, and give the go-ahead for the procedure to begin. The surgery is always done on an outpatient basis, without admittance. The surgery usually lasts approximately 90 minutes, but if performed along with an upper and/or lower blepharoplasty, it can last up to 2-3 hours. In any event, thanks to sedation and local anesthesia, it is a painless surgery. After the surgery is finished, you will remain under observation for about an hour while we apply cold and anti-inflammatories to slow the initial swelling process. During the post-operative process following a brow lift, discomfort and tightness usually appear, especially around the temples. These symptoms will improve with anti-inflammatories and usually go away during the first week. Otherwise, recovery is fast. When the surgery is performed alone, bruising does not usually occur, but there will be a little swelling in the area. After one week, recovery is not yet complete, but most patients do not have any problems resuming their “social” activities at this point. During the first days after surgery, it is important to refrain from vigorous physical activity in order to avoid possible bleeding and to shorten recovery. We recommend applying cold for the first 2-3 days, taking anti-inflammatory medication orally, and applying an antibiotic ointment to the incisions. The first follow-up check is done the day after the procedure, when Dr. Nieto will remove the bandage from your forehead. Should any doubt or problem arise, you will always have direct contact with him. The surgical staples used to close the incisions will be removed 10 days after surgery. Recovery is usually complete by one month after the procedure, but sometimes it may take a little longer. The results of a brow lift are lasting, but it is important to understand that this surgery does not stop the aging process.